Eternal_Freedom wrote: Alternately, keep the troopers inside the ship and use the turret gun to blast away the edges of the bay doors (as that's where the shield projectors are likely to be) then move us out, keeping close to the hull to stay within the warp field and out of phaser firing arcs, then repeat my original plan of firing on the nacelles. If possible, I will clamp the dropship to the hull to ensure we stay attached when the ship drops out of warp. Once at sublight I turn the guns on the impulse engines to cause as much damage as possible and disable the ship. I like that plan, that one seems most likely to work to me. Anyone have a counter to it? 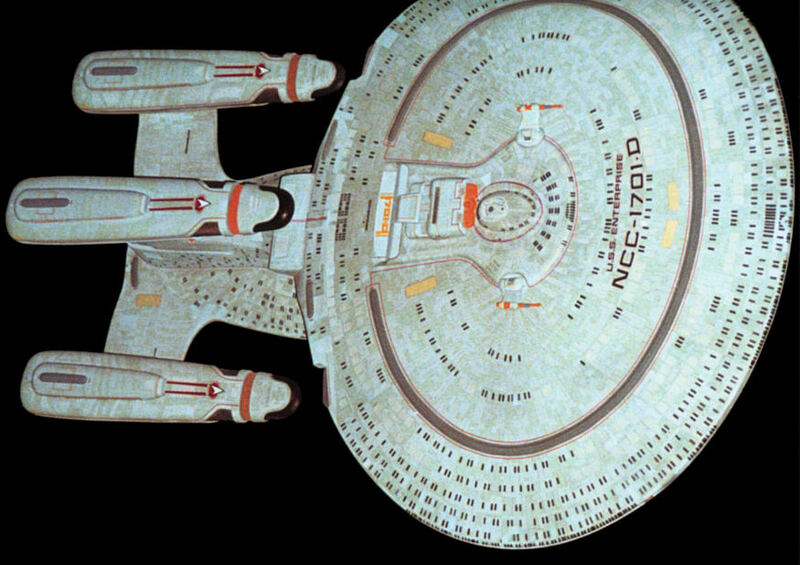 The only thing I can think of is that the GCS has the phasers on the aft section below the bay behind where the saucer and battle sections join, and in this model, she also has one on each of the nacelles, though we don't really know how strong the shields on the lander might be. If the phasers on the nacelles are on the "bullhorns" seen in All Good Things, then they shouldn't have line of sight for the short trip between shuttle bay and a firing position. I don't have to move far after all. Do we ever see these rear-mounted phasers you speak of? I can't recall them ever being used. Even so, as I said I don't have to mvoe the ship very far to get line of sight on at least part of the nacelles, and we have no idea if those phasers can hit targets that close to the ship (indeed, whether they would even want an exploding dropship that close to the hull). Not the bullhorn ones; these ones have line-of sight, or nearly, to the shuttlebay. Highlighted on diagram; on the original Galaxy Refit model they're also visible, I do not recall those ever being used, but they're said to be such in various materials such as the tech manuals, and are obviously set up to appear as such. I wonder if they could use the tractor beam as a repulsor beam to shove the lander away? Huh, I'd forgotten this refit has a third nacelle that should be visible from within the shuttle bay. I don't even have to leave to complete my plan. Does the Progress have bubble- or hull-hugging-shields? If it still has a bubble shield, you'd be inside of the shield bubble and your plan may succeed. But if it has hull-hugging shields, your plan can only work if your weapon fire can penetrate the shields around the nacelles. And if the shields are not semipermeable, your weapon fire has to penetrate the shields even two times. But even if you cripple the Progress, you still have the problem that the computer may be locked or the auto-destruction activated. When the Bynars commandeered the Enterprise in the TNG episode "11001001", the first thing Picard and Riker did was to activate the auto-destruction. When Ferengi boarded the Enterprise in the TNG episode "Rascals", the first thing Riker did was to lock out the computer's command functions. When the Kazon boarded the Voyager in the VOY episodes "Basics", Janeway wanted to activate the auto-destruct sequence. This was even expected from Seska and prevented by disabling the ship's power systems and the primary computer core. WATCH-MAN wrote: Does the Progress have bubble- or hull-hugging-shields? It's a GCS, so bubble-shields are order of the day. As a specification of this scenario, that objection is fine. As a conclusion, it does not seem to be conclusive: USS Enterprise E - a ship of the Sovereign class - had bubble shields when fighting the Borg in "First Contact" and - after being retrofitted - hull-hugging-shields when fighting the Remans in "Nemesis". This shows that the kind of shield is not unchangeable within a ship class or even with a specific ship. And if I'm not mistaken, in the Dominion war, there were Galaxy class ships with hull-hugging-shields. I can't remember to have seen bubble shields around the galaxy class ships (or any other ship). My impression was that the hull-hugging shields were an advancement and if that is the case, it would only to be expected, that the USS Progress has the more advanced shields and not the old-fashioned shields that the USS Enterprise D used some decades ago. This can't be the case, as the E-A was using hull-huggers at Khitomer. It's more likely that shield geometry has always been variable (possibly requiring a refit, possibly with the touch of a button), rather than indicating any significant technological change. The prevalence of one over the other would reflect the prevailing assessment (either generally or for a given tactical situation) of the balance of advantages vs disadvantages of the two configurations. I suspect that they didn't start using shield effect grafics until TNG (in real life) which would mean that TOS ships had hull hugging shields (can't remember if vulcans or andorians had bubble or hull hugging shields in ENT). But in that case, the Captain of the USS Progress would be an idiot not changing the configuration of the shields to hull-hugging - with an enemy ship in the hangar bay that would otherwise have a clear line of fire to the warp nacelles. Lord Revan wrote: I suspect that they didn't start using shield effect grafics until TNG (in real life) which would mean that TOS ships had hull hugging shields (can't remember if vulcans or andorians had bubble or hull hugging shields in ENT). I think the first SFX shields were the E-nil and the BoP in TSFS. In any event, TUC was made well after shield effects were introduced to TNG, so if they had wanted to show bubbles they could have. Assuming that shield configuration can be changed by the touch of a button, rather than requiring a shipyard job. Captain Seafort wrote: Assuming that shield configuration can be changed by the touch of a button, rather than requiring a shipyard job. But considering that they can change all possible settings by the touch of a button - inclusive many settings of the shields - I think - without having evidence for it - that the change between bubble- and hull-hugging-shields can be achieved by the touch of a button too. To paraphrase your own posting style: evidence that they can change "all possible settings by the touch of a button?" They may be able to change many things about their shields (modulation, power level etc) but we never see them change shield geometry (something that, incidentally, SW apparently can do according to Han in ANH) so I do not think it is reasonable to assume such a change can be made. To expand on what others have said, we see hull-hugging shields in the TOS films (including TWOK if the shield display is indicative), bubble shields in TNG, DS9 and Voyager. Only when we get to Nemesis, after the ship has had a hefty refit (given the extra phaser batteries and torpedoe launchers added, not to mention three or four extra decks somehow) do we see her using hull-hugging shields. Additionally, I cannot recall exactly but I think we see the GCS refit E-D use a bubble shield in All Good Things. On the more substantive argument you made about the computer core being locked out of the autodestruct activated, those are good points but my primary objective is to disable the ship's engines (as stated in the OP) which my plan has a reasonable chance of doing. The OP also states that the ship must be as intact as possible. If the computer cores are locked out, oh well, we can if needs be cut them out of the ship and take them back to base to be decrypted at our leisure. If the autodestruct is activated, well that depends upon the method of autodestruct this GCS refit is using - if it is using the "detonate warp core/antimatter storage" method, then once we storm engineering we should be able to emergency vent the antimatter and/or eject the warp core. If it is using the E-Nil "random explosive charges in the saucer section" method seen in TSFS, then I've no idea. yeah I just noticed I worded that a bit unclearly I meant the classic "bubble" effects either way as you said TUC was made way after TNG started so it stopped being an issue, I suspected it was an issue to begin with only due to TOS not having that great of a budget as movies at the time did use graphics similar to the classic "bubble" effect. Pardon me for asking but where was it stated that SW shields could change their geometry? During their escape from Tatooine in ANH Han tells Chewie to "angle the deflector shield" while he makes the calculations for lightspeed, thus showing SW shield geometry can be altered on-the-fly as it were, while we have no corresponding evidence for ST shields. Eternal_Freedom wrote: During their escape from Tatooine in ANH Han tells Chewie to "angle the deflector shield" while he makes the calculations for lightspeed, thus showing SW shield geometry can be altered on-the-fly as it were, while we have no corresponding evidence for ST shields. There's a number of interpretations of that; I'm partial to the one advanced by Brian Young, naturally, that the deflectors and shields are seperate types of force screen, and the deflectors work by changing the angle of incoming fire. It's advanced more thoroughly with evidence on his site, naturally. At any rate, it is not something ST ships are shown to be able to do, so it is essentially irrelevant for this discussion, especially since you have declared the GCS in this situation to possess bubble-shields. TNG TM p141 wrote: The deflector field itself is emitted and shaped by a series of conformal transmission grids on the spacecraft exterior, resulting in a field that closely follows the form of the vehicle itself. It also says that each nacelle includes two shield generators projectors. But on-screen evidence is almost always a bubble, so I would assume it is normally a bubble. So a hull-hugging field is certainly possible for a GCS. I have no idea how quickly they can change over, and obviously they usually run in bubble mode in the series. I have no idea what's required to change over, though they do expand the shields a few times in the series that I recall, to protect the romulan scout in The Defector, at least. And yeah, reconfiguring it to protect the nacelles from the saucer seems like it would not be something they'd do normally. Eternal_Freedom wrote: On the more substantive argument you made about the computer core being locked out of the autodestruct activated, those are good points but my primary objective is to disable the ship's engines (as stated in the OP) which my plan has a reasonable chance of doing. The OP also states that the ship must be as intact as possible. If the computer cores are locked out, oh well, we can if needs be cut them out of the ship and take them back to base to be decrypted at our leisure. If the autodestruct is activated, well that depends upon the method of autodestruct this GCS refit is using - if it is using the "detonate warp core/antimatter storage" method, then once we storm engineering we should be able to emergency vent the antimatter and/or eject the warp core. It can do both, according to the TM. TNG TM p141 wrote: In the worst-case examples, all propulsion and defensive systems are irreversibly disabled or destroyed, and there is no possibility of assistance by other Starfleet or allied vessels. A high probability that the ship can be boarded or tractored then exists, and the activation of the auto-destruct sequence within the computer is to be the final event. To a lesser degree, certain scenarios judge a disabled starship to be a catastrophic danger to a greater number of living beings; e.g., the population of a planet, requiring the abandonment of the ship and its subsequent destruction to prevent the disaster. by a deliberate release of warp engine reactants. Remote computer system decryption algorithms generate one final set of cascade failure commands, and all engine safety interlocks are compromised. Matter from the primary deuterium tankage and the total supply of antimatter from the storage pods on Deck42 are expelled simultaneously, producing an energy release on the order of 1015 megajoules, roughly equivalent to 1,000 photon torpedoes. If the command links to the engine systems are severed, the secondary destruct system is automatically selected. Ordnance packages are located at key locations around the vehicle, including the antimatter storage pods. These are detonated in concert with intentional overloads of all fusion reaction chambers. The release yield of the secondary system is calculated to be 109 megajoules, roughly equivalent to 500 photon torpedoes. The secondary destruct system becomes the primary system for the Saucer Module in Separated Flight Mode. As an aside, the 1021 J (1015 megajoules) number is interesting, as that implies the photon torpedo is a highly respectable 1018 J (239 megatons) which is somewhat higher than calculations that have been derived from this same book based on the antimatter load of the standard photon torpedo; perhaps there is a 239 megaton 'heavy' torpedo or some such. Amusingly that also means that the entire engine system of a GCS is... 239 gigatons in a self destruct scenario, a little bit more than the Acclamator guns in the ICS. I guess we know what that'd look like then (Not quite, as a beam weapon would go through the other side rather than exploding, but still). In any case, it can overload the warp core, or use Ent-nil style destruct charges. There's a map in the book that shows dozens of large and small destruct charges throughout the saucer, three in the engineering section, and three in each nacelle. Hmmm...the autodestruct is a thorny issue. The only solution I can see is to damage the centre nacelle with turret fire untilt he ship drops out of warp and hope the ISD can turn up and disable the ship via mag-pulses before the Captain decides to blow the ship. Certainly the OP says the crew can recover from a mag-pulse bombardment relatively quickly, but if I send a message to the ISD that they need to move as quickly as possible then I think we might have a chance. As soon as the ISD appears it fires off as many mag pulses are needed to once again disable the ship while launching reinforcement forces at the same time. If we have guns light enough to do it without over-penetrating, have the ISD land a shot at the GCS' bridge to eliminate senior command staff before they can issue any autodestruct orders. My own troops will immediately rush for engineering to secure it as quickly as possible. One of the first things the crew of the USS Progress certainly would try to do is to prevent that the Stormtroopers in their shuttle bay can send a message out and call for reinforcement. They would try to jam their communication. I am working under the assumption that the First Order vessel is persuing but is unable to knock them out of warp/slipstream without destroying them. Furthermore, if the GCS does drop out of warp in FO space I would assume the ISD will resume it's attack and once again send boarding parties, only probably in greater numbers (in case the Fed crew get the phasers back online again) or because the ship ran after firing on our ships so must have something to hide. Yes they may jam all transmissions, you are correct, but is this ever something we see? Not that I can recall. Even then, it would not stop purely visual communications such as (for example) laser signallers or sometihng as simple as flashing the running lights. Of course, that requires the ISD be in line of sight to the shuttle bay which is not guaranteed. With that in mind I will amend my plan somewhat. Once the ship drops out of warp I will move the dropship out of the shuttle bay and, staying as close to the hull as possible while keeping my shields up, move to a position just behind the observation lounge behind the bridge, and proceed to open fire with my blaster turret (if I can do it without exposing myself to phaser fire, maybe even move so I can get a shot at that big round window in the bridge ceiling, so that the command crew are distracted by nearby hull breaches, loss of atmosphere, or the possibility of heavy-ish blaster bolts flying through their torsos. NecronLord wrote: according to the TM. I've been pointing this out for years. What's even more interesting is that the numbers given for the secondary system imply a PT yield of about half a kiloton. That's a pretty hilarious oversight given it's in the very next paragraph. 1,000 photon torpedoes is 10^15 MJ but 500 is only 10^9? Are torpedo yields exponentially related to how many you set off at once? I would assume it's a typo, really. They obviously intended that to be half the figure of the engine overload and screwed the math, IMO. They also gave the type X phasers a whopping 1.02GW while giving the type IIs (you know, the banana phasers) 4.5E7 MJ power cells. A hand phaser power cell therefore should be able to power one of the ship's main phaser arrays for 12 hours of continuous fire. I think it's safe to say the numbers from the TNG TM are questionable at best.